Global attention is focused on the humanitarian crisis in the Eastern Ghouta, the rebel enclave on the outskirts of the Syrian capital (United Nations, 2018). Escalating violence in the area is a development in the making since at least September 2017. The intensification of incidents, particularly airstrikes, has also led to a peak in the number of reported civilian fatalities. The most recent wave of violence comes as government and allied forces have launched a full-scale assault to retake the area, although the enclave has been subject to siege and government bombardment since at least 2013 (Lund, 2017). The general narrative surrounding the crisis implies that there has been an extreme and unexpected intensification of violence in 2018 in the enclave. Indeed, averages of the number of conflict events in January and February 2018 were between two and three times the average number of monthly events across 2017. However, the recent escalation initially began around September 2017 and has been increasing ever since (with a drop during December). The increase in overall violence is largely a product of increased remote violence. The number of battles and battle-related fatalities were roughly consistent across 2017 and 2018. However, there was a distinct escalation in the number of remote violence events since September 2017 — with an over 250% increase from 2017 averages in January 2018, and a further 60% increase in February. 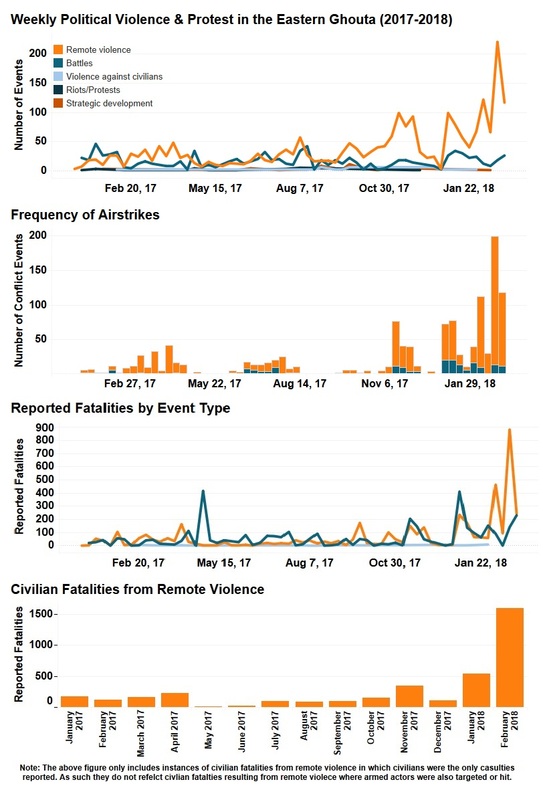 The number of shelling events and heavy machine gun violence have not increased; rather, aerial bombardments by Syrian (and/or Russian) Air Forces are responsible for the escalation – likely a result of freed resources after the violence against IS subsided. The increase in the number of remote violence events has – as news headlines point out (BBC, 2018) – also led to an increase in the number of reported direct civilian fatalities, particularly in February 2018. In 2017, civilians accounted for at least 40% of fatalities reported inside the enclave – meaning that much of the violence was targeted against combatants. However, across January and February of 2018, reported number of direct civilian fatalities rose to make up over 60% of all reported fatalities in the Eastern Ghouta. There is no sign that this upward trend will soon subside if the first few days of March are any indication of future trends. As the international community focuses on ending the violence in the Eastern Ghouta and its growing impact on civilians, keeping a close eye on patterns and modes of violence will be key to both understanding by what means civilians are affected and informing policy and humanitarian action to mitigate and prevent a further increase in this violence. In the last ten days of February 2018 alone, approximately 600 civilians were reportedly killed in the Eastern Ghouta (Syrian Observatory for Human Rights, 2018). There were periodic spikes in battles and remote violence in 2017, concentrated around several key fronts in the area. The number of civilian fatalities in the Eastern Ghouta is, in fact, even higher than these figures indicate. Due to the difficulty of accurately discerning between civilian and combatant fatalities during battles and other events in which civilian deaths are coded as collateral damage, the above fatality estimates refer specifically to those stemming from events in which civilians were reported as being the primary target of the violence.